Each day of a week is dedicated to a particular god in the Hindu pantheon. Lord Surya or Suryanarayana – the Sun God, the deity of the sun rules Sunday. But today being Varaha Jayanti, special Puja is organized in Lord Vishnu temples. 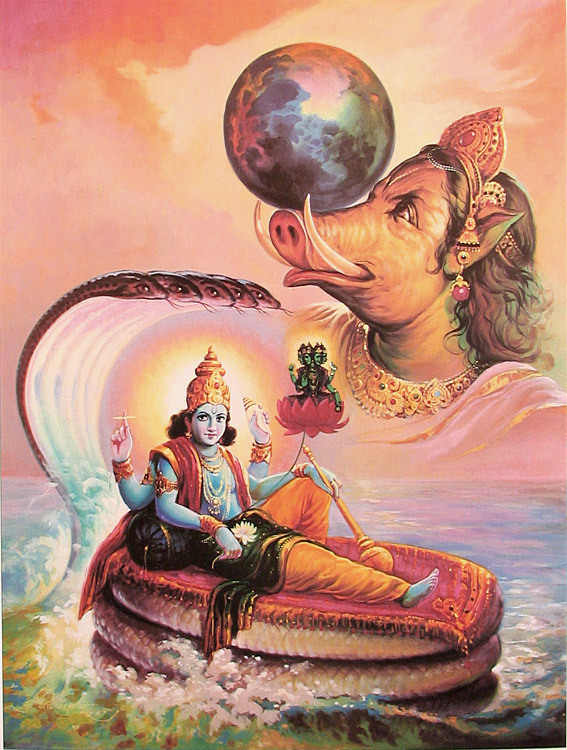 Varaha was the third incarnation of Lord Vishnu during Satya Yuga. Varaha is the avatar of the Hindu god Vishnu in the form of a boar. Varaha is listed as third in the Dasavatara. jitam—all glories; jitam—all victories; te—unto You; ajita—O unconquerable one; yajña-bhāvana—one who is understood by performances of sacrifice; trayīm—personified Vedas; tanum—such a body; svām—own; paridhunvate—shaking; namaḥ—all obeisances; yat—whose; roma—hairs; garteṣu—in the holes; nililyuḥ—submerged; addhayaḥ—the oceans; tasmai—unto Him; namaḥ—offering obeisances; kāraṇa-sūkarāya—unto the hog form assumed for reasons; te—unto You. Ravivar, or Sunday, is dedicated to Lord Surya or Suryanarayana. Upvaas or fasting on the day is dedicated to the Sun God. Red is the color of the day. Devotees offer red color flowers to Surya and apply red sandalwood paste as ’tilak’ on their forehead. Ravivar Vrat or Sunday fasts help in fulfilling one’s wishes and it is believed that all kinds of skin diseases get cured. On this special day, Varaha Swamy Jayanti, Devotees mainly visit any vishnu temple near by and seek his blessings. Next articleSymbolism Of Ganesha – What Does It Indicates?